How Many Passengers Can it Seat? The 2016 Nissan Rogue works hard to stand out among the many small crossovers available today. It offers some unique features that others don’t. The high quality cabin is definitely a plus, too. While basic safety scores aren’t as high as they should be, the Rogue does offer some class-exclusive crash avoidance features. The basic Rogue is a five-seat crossover, but it is offering two more seats on an extra-cost third row. Only one other in its class can make the offer. How Spacious is the 3rd Row? The third row will only seat children comfortably. Still, for those who need it, it will be a welcome addition. For the most part, the Rogue remains the same, except for new technologies. The exterior has been dressed up a bit by an available Appearance package. New to the Rogue, Nissan’s enhanced collision mitigation system includes automatic braking and the predictive abilities that watch for cues further ahead than just one car length. Nissan has added Siri Eyes Free, which works with iPhones to deliver many more services via the dash touchscreen. It has not added Apple CarPlay or Android Auto, two services you’ll find on some rivals. NissanConnect Services are now available on the SL trim, adding an emergency telematics system. The two-row Rogue is offered in three trim levels (S, SV, SL) while the three-row Rogue is limited to the S and SV trims. The S exterior includes steel wheels and LED running lights. The interior has a split-fold rear seat, a five-inch central display and a rearview camera. Phone and audio connectivity is available via Bluetooth. The new S Appearance package adds chrome trim, roof rails, and rear privacy glass. The SV trades heavier steel wheels for lightweight alloys. Drivers will appreciate push button start and a power driver’s seat. Everyone can appreciate the dual-zone programmable thermostat. The SV also features Nissan Connect smartphone app integration with more stereo speakers. The SL adds heated side mirrors, foglights, and bigger wheels. It also has a power liftgate and the Around-View camera. A large touchscreen is equipped with voice controls, navigation, and Siri Eyes Free. Many of these features are available through a Premium package on the SV. However, only the SL edition has leather upholstery and upscale trim. A Premium package for the SL adds a panoramic sunroof and crash avoidance features. The 2016 Nissan Rogue is notable for its high-quality materials and a more upscale look, especially among upper trims. Soft touches and well-padded armrests make the cockpit more welcoming. The seats are made of a special foam. Based on NASA technology, Nissan developed these Zero Gravity seats to provide fatigue-free rides. EZ Flex second row seats can slide and recline. QuickComfort seat heaters work more quickly than other heaters to achieve their desired temperature. The biggest exclusive is the Nissan Divide-N-Hide system. In the two-row editions, shelves and cubbies add organization to the large hold. The second row can slide forward nine inches to allow for more cargo space. 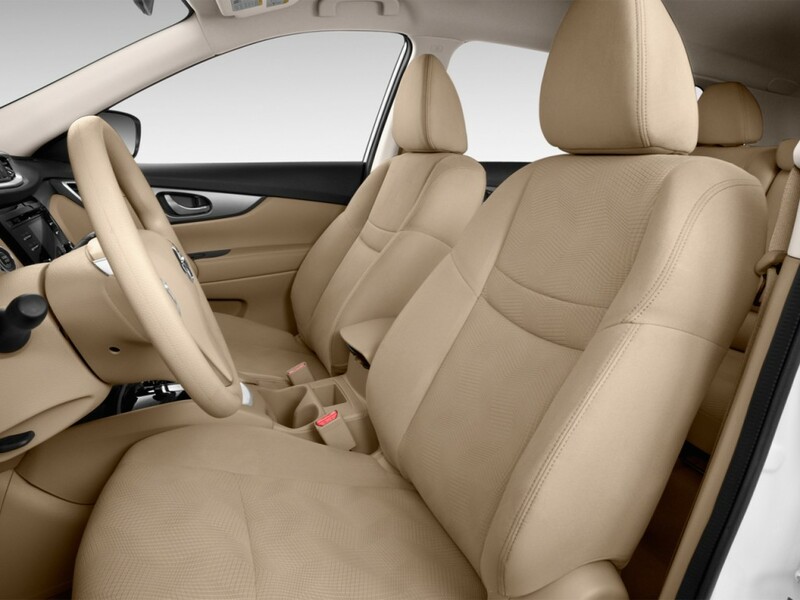 When all of the seats are folded, the user can claim 70 cu.ft., matching or exceeding most rivals. The Rogue offers a typical crossover engine. A bit underpowered, it doesn’t always stay as competitive as drivers might like. The four-cylinder engine delivers 170 horsepower with a comparable level of torque. While this is typical of the class, some crossovers offer a V-6 alternative that the 2016 Nissan Rogue does not. Still, this is a good powertrain in many ways. It can handle normal acceleration with ease. Paired with an independent suspension, it permits greater flexibility. Active Ride Control adjusts throttle, braking and transmission to better meet conditions. This can help on curves, climbs, and other challenges. Drivers can expect 33 mpg highway with the front-wheel drive. That drops to 32 mpg with all-wheel drive, which is very good fuel economy for an AWD model. Some reviewers are reporting lower numbers than the EPA averages, however. The 2016 Nissan Rogue still falls short in crash testing. Like the 2015, it earned only four stars when tested by the National Highway Traffic Safety Administration. Balancing that, however, it is offering some crash avoidance technologies that are hard to get on rivals. For instance, it uses a radar-based blind spot system rather than a simpler, camera-based one. This also applies to its rear cross-traffic system. Only the Rogue offers emergency braking with predictive crash avoidance. The predictive feature looks further ahead than most systems, making it even more effective. To keep an eye on the SUV’s perimeter during slow maneuvers, there’s an available AroundView monitor. This can be equipped with moving object detection. MOD can spot bikers, hikers, and large animals. All of this comes at an extra cost, of course, and that may force some shoppers to look elsewhere. On the one hand, there’s the ride quality. That’s pretty good for a small crossover. This SUV’s suspension allows it to roll over ruts while communicating little roughness to the passengers. Nissan also manages to deliver a somewhat hushed ride, keeping wind and noise from dominating the cabin. On the other hand, there’s the car’s drivability. Test drivers report ponderous handling that is made worse by the noisy Continuously Variable Transmission. This type of automatic has endless gear possibilities and keeps fuel costs low, but it also may drone when engaged for quick acceleration. Some drivers report that if you drive a CVT regularly, you can adapt to its whims and enjoy the ride more. Even with its potential drawbacks, the 2016 Nissan Rogue still offers so much with its unique features that it deserves a second look. The intelligent organization system and available third row definitely encourage many shoppers to give it a test drive. Thinking of buying a Nissan Rogue? Already own one? Leave a comment and let us know what you think!